The U.S. 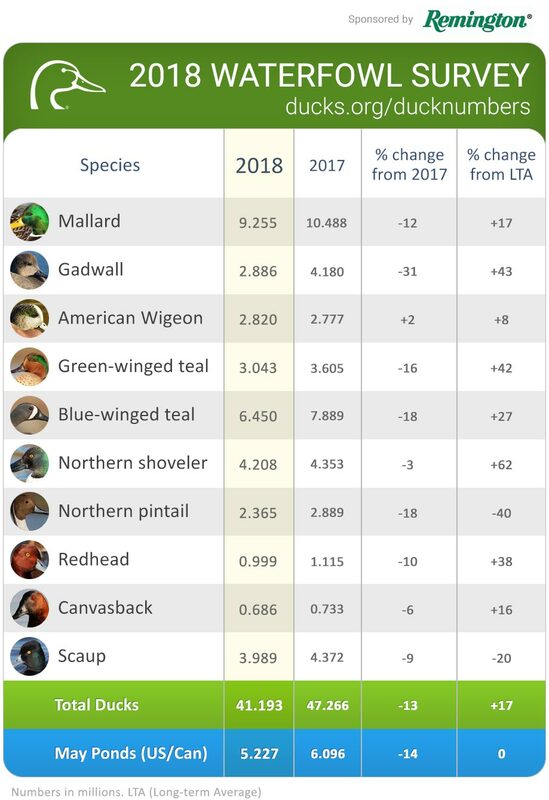 Fish and Wildlife Service (FWS) today released its report on 2018 Trends in Duck Breeding Populations, based on surveys conducted in May and early June by FWS and Canadian Wildlife Service. Overall duck numbers in the survey area remain high. Total populations were estimated at 41.2 million breeding ducks in the traditional survey area, 13 percent lower than last year’s estimate of 47.3 million and 17 percent above the long-term average. The projected mallard fall flight index is 11.4 million birds, down from the 2017 estimate of 12.9 million. "The dip in the population for prairie-breeding puddle ducks is not unexpected and by no means unprecedented given that conditions on the prairies this spring were drier than last year," said DU Chief Scientist Tom Moorman. "As a result, 2018 populations dropped accordingly. However, populations of all key species except northern pintails and scaup remain above long-term averages. This year's breeding population decline is a reminder of the need to sustain the capacity of breeding habitats, particularly in the prairies as we go through natural variation in wetland conditions. Waterfowl populations are adapted well to short-term swings in habitat conditions, but we must continue to guard against the long-term loss of prairie breeding habitat."